I recently ran into the problem of having to store a directed graph in MySQL. Actually, I was trying to efficiently store a thesaurus in SQL so that it both used little space and had high performing lookups. 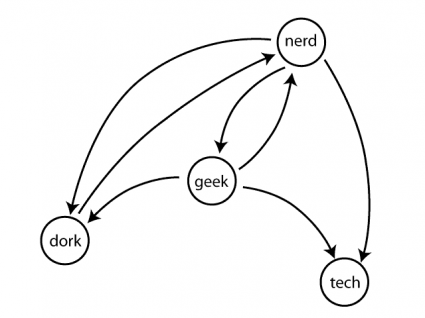 A thesaurus, as you probably know, could best be represented as a graph of some type; perhaps as a tree (in a naive implementation), or a directed acyclic graph, or even a directed multigraph. This quickly becomes much more complex as we want to attach definitions to words, and some words in the thesaurus may be the same ‘word’, but a differing class of speech, such as a noun, verb, etc. Relatively fast and efficient lookups can now be done using SQL JOIN. While I’m sure this isn’t the most optimal structure for performance, it has to be close to the most efficient(*) means of storing these cross references. It contains 83,318 words and phrases, and 1,112,705 cross references for synonyms. Most uncached lookups take place on the order of less than a 1/10th of a second on this busy shared hosting server. Cached queries are virtually instantaneous. And of course, MySQL is not my area of expertise; I would imagine that this could be made even faster.